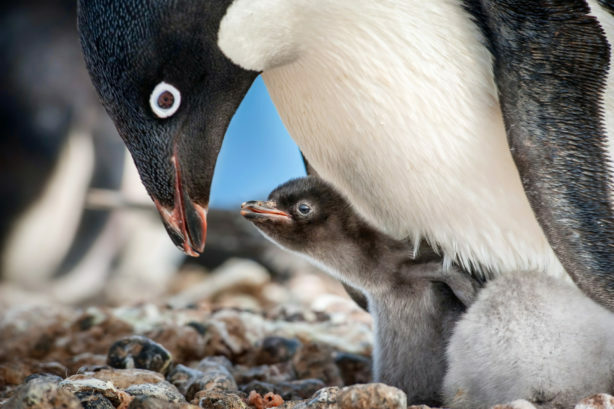 Through breathtaking photography and compelling storytelling that is grounded in reality, Disneynature’s Penguins, opening in U.S. theaters today, transports audiences to Antarctica to go on a journey with Steve, an Adélie penguin who sets out to build a suitable nest, find a life partner and start a family. Despite punishing weather conditions and predators that include killer whales and leopard seals, Steve’s quest is relatable to modern audiences who will empathize with the first-time father as he navigates parenthood with nothing to go on but instinct. Penguins, the eighth theatrical release from Disneynature, continues a legacy that dates back to Walt Disney himself. The 28-minute-long documentary Seal Island was the first of 13 True-Life Adventures to be produced by Walt between 1948 and 1960. The films won eight Academy Awards® following their theatrical debuts, and continued to captivate viewers as they were later featured on The Wonderful World of Disney or screened in elementary schools. The pioneering series of documentaries also inspired countless budding conservationists and nature filmmakers, including the team behind Disneynature’s latest film. “They were my introduction to nature in a certain sense. And I just remember as a kid the wonder of these amazing animals, whether it was The Living Desert (1953), The Vanishing Prairie (1954) or Jungle Cat (1959),” says Penguins producer Roy Conli, an animation veteran whose credits for Disney include the Oscar®-winning Big Hero 6 and Tangled, as well as Disneynature’s Born in China. 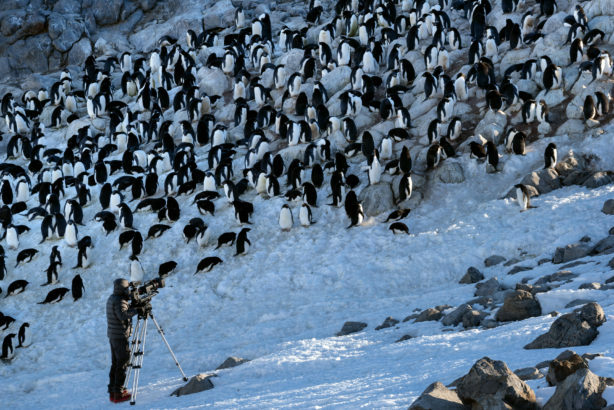 For Penguins, the production team went to greater lengths—and colder temperatures—than ever before, making it the largest logistical operation ever undertaken by Disneynature. The world’s top polar experts spent three years filming in Antarctica, capturing footage between October and February—the only viable window before the sea ice freezes over and sun sets on the region for six months. The filmmakers shot for nearly 900 camera days, including 128 days of underwater filming, in remote locations that were accessed by helicopter, by boat and on foot—and rarely did the temperature rise above 14 degrees Fahrenheit. The team also faced the same climatic challenges as their subjects, including subzero temperatures and katabatic winds in excess of 150 miles per hour. “In these conditions, tents and emergency shelters can disappear in an instant and one could succumb to exposure in a matter of minutes. We had to draw on every ounce of our experience to survive these conditions,” says Wilson. The filmmakers called upon innovation and ingenuity to tackle a very different challenge during production: how to spotlight Steve, rather than his approximately 499,999 Adélie neighbors. 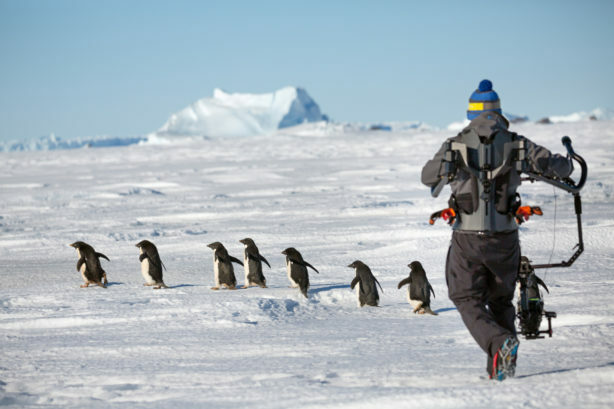 In addition to wide-angle lenses, shallow depths of field and careful framing to keep Steve front and center, the photographers also engineered a specially designed “penguin cam” involving the use of a Ronin, or stabilizing rig, that’s typically used follow humans at their eye level. To film the diminutive birds, the filmmakers literally flipped the Ronin on its head and made additional modifications that would provide maximum stability while they tracked the winning penguin protagonist. Penguins continues the Disneynature tradition of empowering the audience to join Disney in making a difference—taking to heart the words of Walt Disney, who noted that conservation is “a matter that concerns all of us.” For every ticket sold during the film’s opening week (April 17–23), Disneynature will make a donation to the Wildlife Conservation Network (WCN) to help protect penguins across the southern hemisphere. WCN invests in a select network of on-the-ground conservationists, including top experts in the field of penguins like the Global Penguin Society (GPS), the worldwide leader in science-based penguin conservation. Visit Nature.Disney.com to learn more.